Digging out reactor core in 1979 with a shovel and without a mask on. 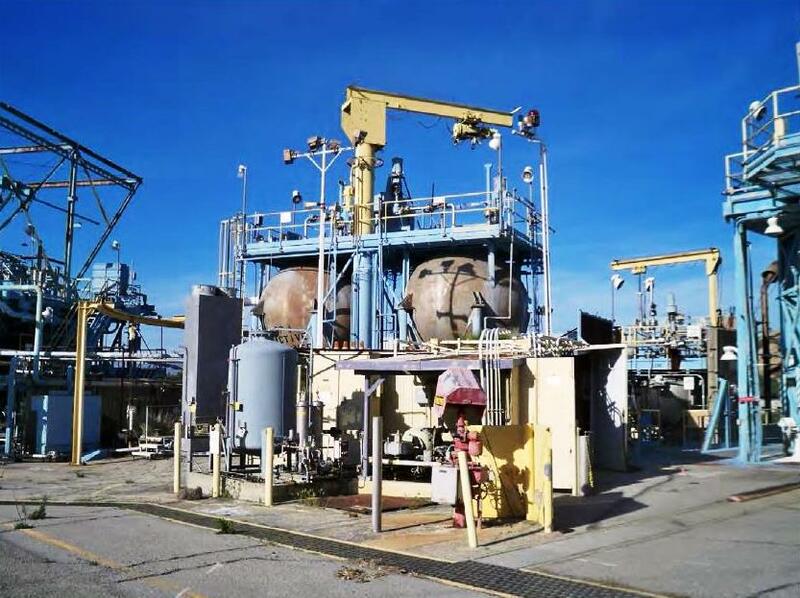 After more than four years of preparation, CalEPA’s Department of Toxic Substances Control (DTSC) debuted its massive draft programmatic environmental impact report (EIR, DEIR or PEIR) for the astronomically polluted Santa Susana Field Laboratory (SSFL) on September 7. The long overdue yet calculatingly uninformative EIR breaks the agency’s previous cleanup commitments, leaves out any risk assessments, and ultimately recommends no cleanup of the site. Over 1,000 pages are devoted to demonizing any cleanup as being worse than leaving the contamination in place yet there isn’t a single page devoted to saying what the risks are to the public from contamination that would remain on site under varying levels of remediation. Unlike any other EIR that EnviroReporter.com has analyzed, these documents offer little information for the public to really comment on, including how much radioactive and chemical contamination DTSC will require the responsible polluting parties clean up. Using Trumpian doublespeak, DTSC claims to have bared all and resorts to outright fabrication early in the EIR. “Advantages of a PEIR,” says one section in part one of Appendix C, “Ensures full consideration of cumulative impacts.” It is just one of many fabrications presented as fact employed by DTSC in this document prepared by a subcontractor for lab owner Boeing. 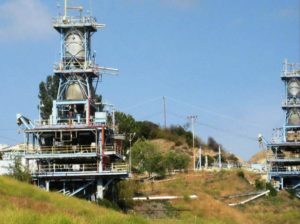 What is clear, however, is California Governor Jerry Brown’s imprimatur on his toxics department has done more to damage any chance of cleanup at SSFL than at any other time in the 19 years this reporter has written on the Cold War-era Rocketdyne lab. Long ago exposed as a tool of the polluter in EnviroReporter’s 2012 Toxic Department, DTSC has plumbed new depths in denying SSFL, and the impacted surrounding area, the cleanup it had long promised Southern California. 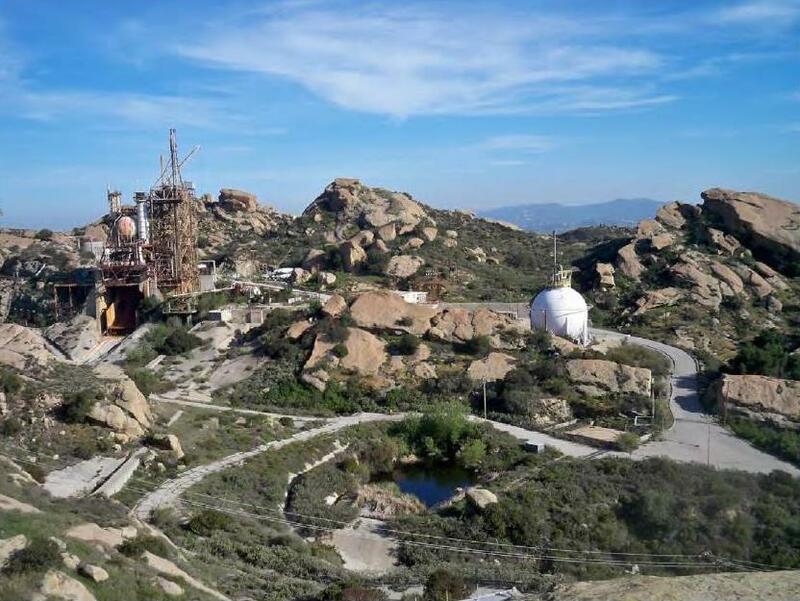 DTSC effectively buries any hope of any substantial cleanup of an astronomically fouled field lab sitting at the heart of Southern California. It is government against the people who elected a governor who has no intention of protecting them from the menace that is SSFL. That would, in effect, allow Boeing to walk away from SSFL with about 98 percent of the toxins tainting the area left in place to supposedly decay away. 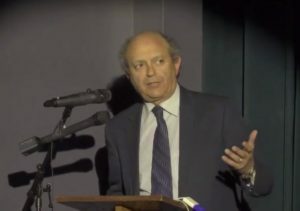 SSFL, which has suffered three partial nuclear reactor meltdowns and conducted over 30,000 rocket engine tests, would see no more substantial remediation before it is released with no restrictions. Facts be damned, fission forgotten, and public health protections jettisoned all the while posing as saving the environment. The Boeing website is the culmination of an elaborate and expensive “greenwashing” scheme first cooked up in 2012 with former Los Angeles Times environmental reporter-turned polluter image polisher, Gary Polakovic and his aptly named Make Over Earth, Inc.. In the Age of Trump, portraying the polluter as environmental savior with a straight face may not seem such a stretch. 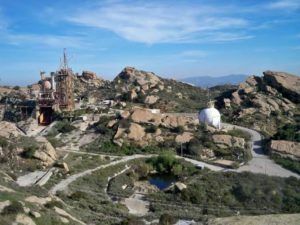 In an effort to counter Boeing’s brazen website, the Rocketdyne Cleanup Coalition and other groups launched their own site, Protect Santa Susana from Boeing. The website calls out Boeing for its greenwashing campaign and rips DTSC’s EIR as equally manipulative. Indeed, DTSC’s massive DEIR doesn’t examine the greatest ecological threat at SSFL which is obviously the radioactive and chemical contamination. 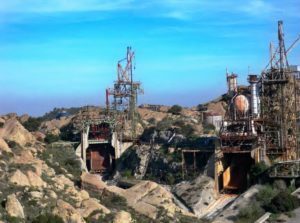 Instead the puzzled reader is treated to anything but the real numbers on how many people could get cancer if the former Rocketdyne complex is not cleaned up to background levels or cleanup standards dictated by Ventura County’s zoning of the site, which would be the most protective. Teasing out the EIR, it seems DTSC will decide to clean up nothing at all, that the cleanup is the enemy and not the high levels of radionuclides and chemicals that span SSFL from its eastern entrance in Area I all the way to its Area IV western border with Brandeis-Bardin and Runkle Canyon. That is if the department can succeed in fooling the vast majority of the public who want SSFL completely cleaned up including the political leaders that represent them. Evidence, however, of the lab’s widespread radiation problems can be found in the draft EIR’s “Appendix K, Draft Excavation and Offsite Disposal Volume Estimate for Boeing Areas I, III, and Southern Buffer.” Cesium-137 was found far from nuclear Area IV near the lab gates in Area I. At the Laser Engineering Test Facility/Component Test Laboratory, radioactive “heavy water” or tritium was found. Europium-152 was found in the Area I Burn Pit at 8.7 times its background threshold value (BTV) as determined by a the US EPA’s $41.5 million radiation study of Area IV’s radioactive soil. Strontium-90 was found in 2011 in Area III’s Systems Test Lab IV at 11.1 times its BTV. According to documentation obtained by EnviroReporter.com, the California Highway Patrol considers any material or situation over three times background to be the triggering level for a hazardous materials incident. These readings outside of nuclear Area IV far exceed that HazMat threshold. None of these HazMat-high contamination finds are in DTSC’s draft EIR. These omissions are not happenstance or mistakes, and could have very real and negative public health implications. The draft EIR also fails to mention the serious contamination issues in the Southern Buffer Zone (SBZ) that became known as a result of Boeing’s own sampling and testing. Close to where guided hikes have taken unwary amblers, are springs contaminated with trans-1,2-Dichloroethene, cis-1,2-Dichloroethene, vinyl chloride and trichloroethene (aka trichloroethylene or TCE). How does anyone even know what DTSC has left out of this hugely important SSFL EIR save what cleanup activists and reporters can pry out of the department’s Boeing-written word salad? The public are the real losers when these serious omissions of fact are allowed to happen. It means plain and simple that massive amounts of radiation, chemicals, dioxins, furans, PCBs and heavy metals will be left all over the place at SSFL as DTSC tries to portray the cleanup as a threat to what itself calls one of the “most contaminated” sites in California. If DTSC’s disingenuous and secretive manner of releasing the draft EIR to the press is any indication, the public should expect no help from this CalEPA department now dominated by Boeing ally Gov. 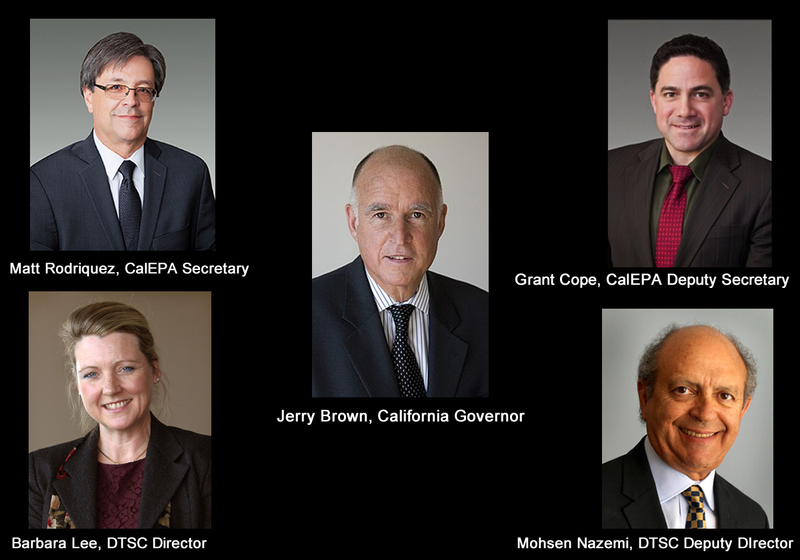 Jerry Brown’s appointees. A September 7 press conference call to explain the EIR with DTSC’s Mohsen Nazemi was marred by false information and incomprehensible platitudes that made little sense at all. Having only just sent the reporters the massive EIR a couple of hours before the call, Nazemi managed to condescend in a manner that implied the journalists present clearly didn’t understand him. Nazemi’s mix of outright falsehoods and incoherent statements left even the most veteran observers of SSFL issues and EIRs scratching their heads. This is simply word play. Of course by not including an analysis of the most protective standards, they were excluded. Agricultural is the most protective cleanup standard, followed by rural residential, both of which are allowable uses in the Ventura County general plan and zoning which DTSC said it would rely upon in 2010. Yet the most protective standard DTSC says would be considered now is, according to cleanup advocates, nearly 30 times weaker than what DTSC’s own official goals for suburban residences. Nazemi and DTSC lean on “reasonable foreseeable uses” in justifying their exclusion of protective standards, clearly using Boeing’s talking points. Boeing says that the site will be open space, so only very weak recreational standards should be considered. Community members says that they don’t live in open space, they live in residential areas and the contamination migrates, so it should be cleaned up at least to rural residential. DTSC implies it is considering residential, but has weakened it, and justifies the weakening with “forseeable uses.” Of course, DTSC also absurdly claims that no harmful SSFL contamination gets offsite and that neighboring Brandeis-Bardin was untouched by SSFL toxins, a claim debunked by EnviroReporter.com August 14 in State toxics department white papers over Brandeis-Bardin contamination. What was doubly puzzling about this natter is that Nazemi said at the top of the call that SSFL was one of the most contaminated sites in the state. Yet the EIR in no uncertain terms says that leaving the goo to degrade is the best option even when years of tests have shown it to not work nearly effectively or fast enough. 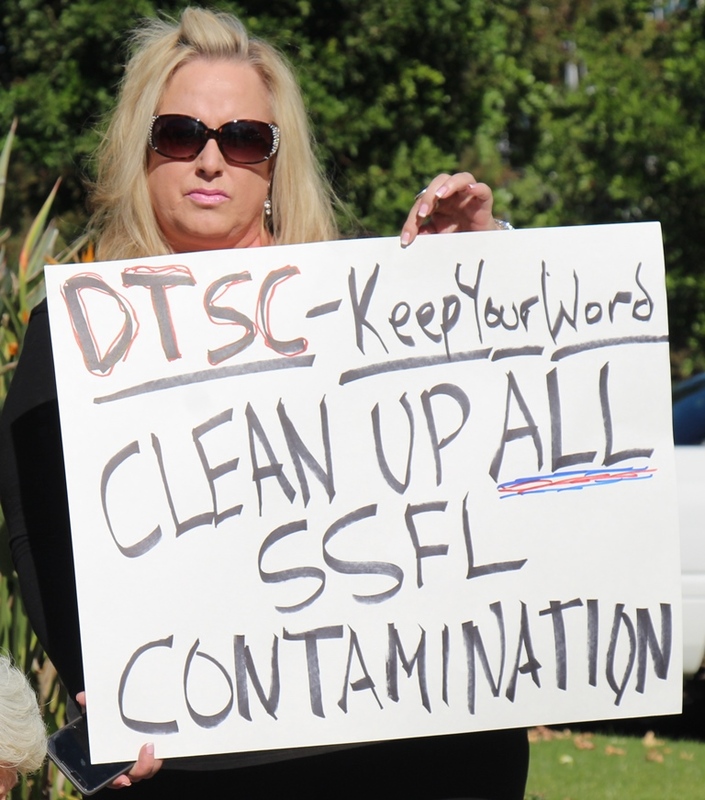 One reporter asked if the public knows how much contamination would be left up at SSFL. Revelations from Santa Monica-based Consumer Watchdog’s 2014 investigation Inside Job went even further showing how California state government pals of Brown used the system to milk it while simultaneously sabotaging the SSFL cleanup. Ultimate responsibility for this unnatural disaster rests with DTSC’s entire SSFL team led by Mohsen Nazemi, DTSC director Barbara Lee, and Gov. Brown. This will be Governor Jerry Brown’s legacy, ‘Glow in the Dark Park’ left unremediated in the middle of millions of people and at the headwaters of the Los Angeles River. It will be a toxic bequest that will be re-exposed, should need be, when the park gates open and the public and media are allowed in to trod about one of the most contaminated sites in California. If the Dept. 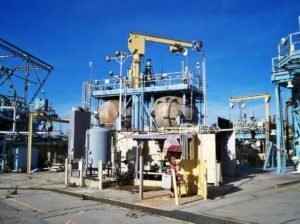 of Toxic Substances Control (DTSC) had kept its word, SSFL would be fully cleaned up right now, we wouldn’t have to worry about SSFL’s radioactive and chemical contamination, especially during wind, rain, and fire events that cause the contamination to migrate further offsite. But DTSC has repeatedly broken its promises. In 2010, DTSC signed legally binding agreements with the Dept. of Energy and NASA that required them to cleanup all contamination in their operation areas of SSFL by 2017. DTSC also said that Boeing would have to clean up to a comparable level. But today, the cleanup hasn’t even begun, and DTSC is considering proposals that would leave up to 90% of the contamination on site. We aren’t the only ones that DTSC has failed. Communities throughout the state have experienced negligence, dysfunction, and corruption from an agency that has been the subject of media exposes and legislative hearings to no avail. Tell Governor Gavin Newsom to appoint a strong reformer to be the Director of DTSC, someone who can oversee a top to bottom reform of this troubled agency. If DTSC continues business as usual, nothing will change, and millions of Californians will continue to be needlessly at risk of exposure to toxic chemicals. Call Governor Newsom at (916) 445-2841 and let his office know that it is important to you that he select a strong reformer as head of DTSC, someone who will ensure that the agency keeps its word, enforces the SSFL cleanup agreements, and puts people before polluters. Please also put your request in writing by clicking this link https://govapps.gov.ca.gov/gov40mail/. Right now, this is the important thing you can do to help the SSFL cleanup. Please contact Governor Newsom today! As you may have heard from newly appointed CalEPA Secretary Jared Blumenfeld, he has accepted my resignation as Director of DTSC. The last four years serving the people of the State of California as part of this extraordinary team have been a privilege and an honor. As I said to you during our last All Staff meeting, we have done tremendous work together, and I could not imagine a group of people with whom I would rather do that work. I have been inspired every day by your passion, and by your commitment to the mission of this Department and the people we serve. DTSC’s mission is vital to California’s future. Each one of you plays an important role ensuring the people of this state and our environment are protected from harmful chemicals. Whether you evaluate permits, process invoices, engage the public, analyze samples, conduct inspections, investigations, or oversee cleanups, work in the office on regulations, or represent DTSC in legal matters, your contribution supports the success of this Department in achieving our mission. It is hard work, but it is essential. I want to thank you for your dedication. I also want to thank you for welcoming me into this family and for the many ways you worked with me to enhance our service to California. 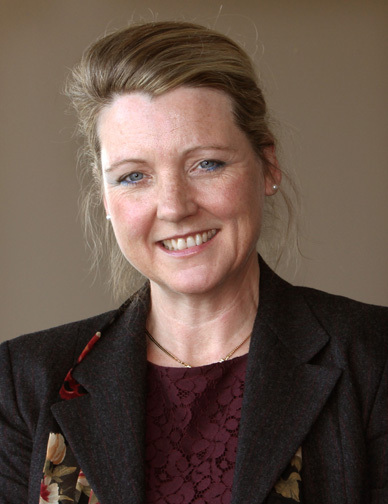 I hope you will be as generous in welcoming Dr. Meredith Williams as Acting Director. You all know Meredith from her work leading the Safer Consumer Products Program. She will provide strong and inspiring leadership and I know you are in good hands in the days ahead. Thank you in advance for the good work you will do for Secretary Blumenfeld and the Newsom Administration in the days ahead. I will be supporting the transition over the near term; however, my last day in the office will be Friday, January 11th. I will leave forwarding contact information with Kim Smith. I wish you all success, and look forward to hearing the great accomplishments this Department will have improving the lives of Californians today and in future generations. It wasn’t always like this. In the decades this reporter has covered SSFL, there have been terrific DTSC personnel like now-retired Jeannie Garcia and the late Steve Cain. Now, the DTSC’s SSFL team has been shown to be thoroughly corrupt, inept and in contempt of the public it is supposed to serve. Governor Gavin Newsom would do well to can the whole crew if he is sincere about really cleaning up Rocketdyne/SSFL before it catches fire again. 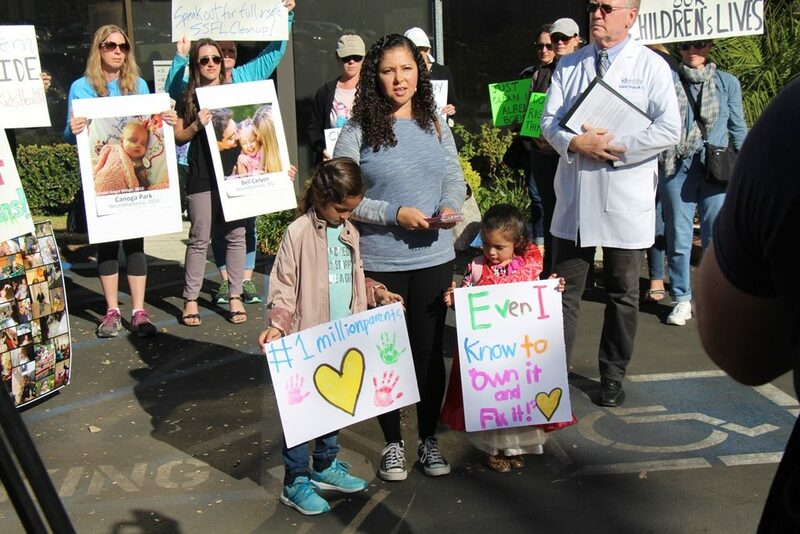 The Ventura County Board of Supervisors voted 3 for, 2 against for sending a strong message to DTSC demanding that it stick to its promised cleanup agreements as noted on the Parents against Santa Susana Field Lab Nuclear Disaster Facebook page. A live feed showed a furious Boeing representative tried to intimate that the County wasn’t within its right to demand the obvious and not buy the company’s claims that the contaminated land should be exempt from current County zoning. Supervisors Linda Parks, Steve Bennett and John C. Zaragoza were praised by pro-cleanup activists afterwards for standing up for the county’s citizens that are most affected by the radioactive and chemical contamination at the still-unremediated Santa Susana Field Laboratory covering 2,850 acres of land long fouled by nuclear and rocket research and testing. This pro-active governance is not what a serial polluter wants when it is trying to slip out of its contaminated land. In any age, especially in the Age of Trump, such acts are remarkable on the parts of the supervisors. The deadline for SSFL EIR comments to DTSC has been extended to December 14, 2017 according to this email DTSC sent out. 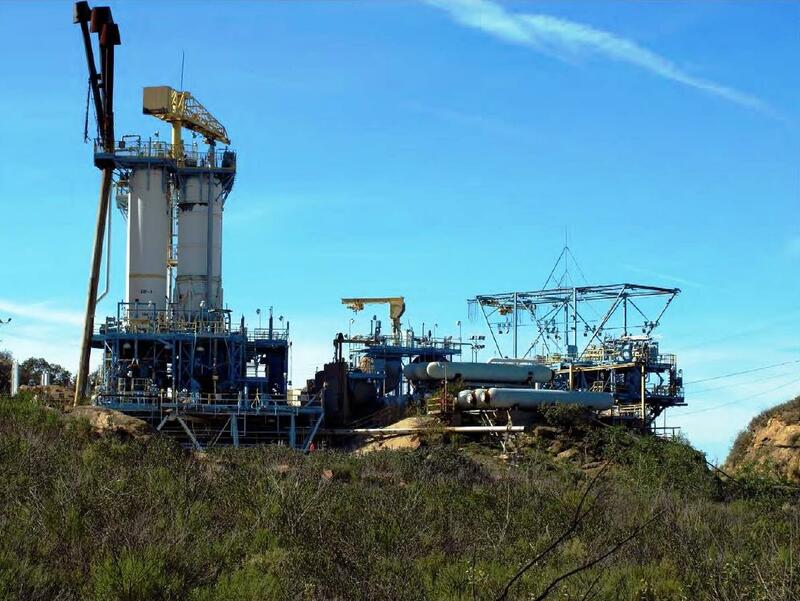 You can make your opinion heard using the Rocketdyne Cleanup Coalition comment form. 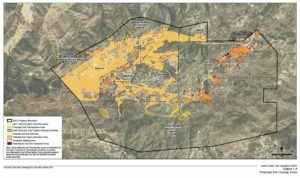 Due to the ongoing wildfires in Southern California, the Department of Toxic Substances Control (DTSC) has extended the public comment period for the Santa Susana Field Laboratory (SSFL) Draft Program Environmental Impact Report (PEIR) and Draft Program Management Plan (PMP) until Thursday, December 14, 2017. The comment period was scheduled to close today. 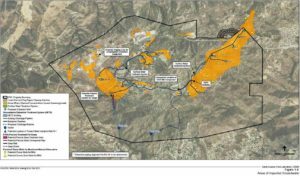 DTSC released the Draft PEIR and Draft PMP for soil and groundwater cleanup for SSFL near Simi Valley in Ventura County on Thursday, September 7, 2017. Note that comments must be submitted in writing, and either postmarked or received by DTSC, by end of the day (11:59 pm) on Thursday, December 14, 2017. If you have questions regarding the SSFL site, please contact Michelle Banks-Ordone, DTSC Public Participation Specialist at (818) 717-6573 or via e-mail at Michelle.Banks-Ordone@dtsc.ca.gov. “Glow in the Dark Park” — that’s exactly what we’re talking about. This IS Jerry Brown’s legacy. We need to run these corporate-aligned politicians out of town on a rail. That means we need candidates, and we need coherent campaigns. Boeing and Brown are probably hoping that potential candidates will stay home and spend their lives treating their kids’ cancers. 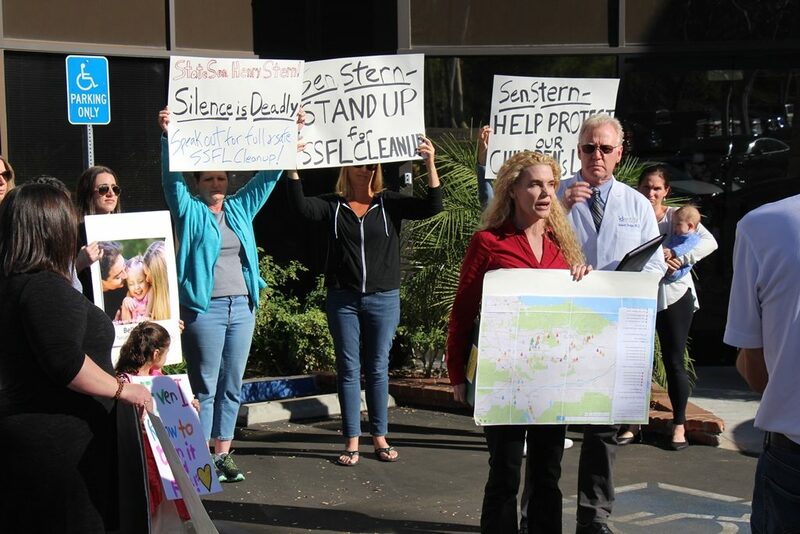 About two dozen parents, with protest signs advocating the full cleanup of SSFL just days before the DTSC comment period ends, went to State Sen. Henry Stern’s office in Calabasas this morning before moving on to DTSC’s Chatsworth offices at noon. They carried with them the signatures of 24,000 people [~130,000 as of Jan 19, 2018] demanding an end to government collusion with the polluter and for it to fulfill its 2007 and 2010 agreements to rigorously remediate the lab. 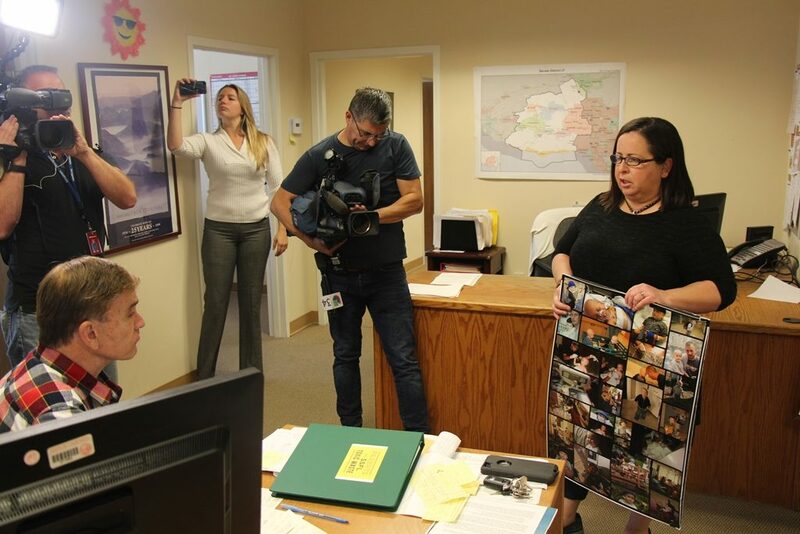 This reporter and one from the Daily News watched mother Maggie Compton show two DTSC officials her binder full of petition signers including their comments and was assured by Michelle Banks-Ordone and Marcia Rubin, public participation officers, that indeed the comments given them would be included as comments on the PEIR. It is heartening to see so many people taking this issue as seriously and energetically as they should. It is also heartening to see so many media covering the events just one day after the formerly venerable LA Weekly collapsed – the paper featured this journalist’s SSFL reporting since 1998. Other media outlets covering the demos included Univision television, CBS Los Angeles Channel 2, Daily News newspaper, KFI AM 640 radio and KNX 1070 NEWSRADIO. EnviroReporter.com, which also attended today’s actions, will continue its award-winning coverage of SSFL that it began with LA Weekly and Los Angeles magazine 19 years ago. 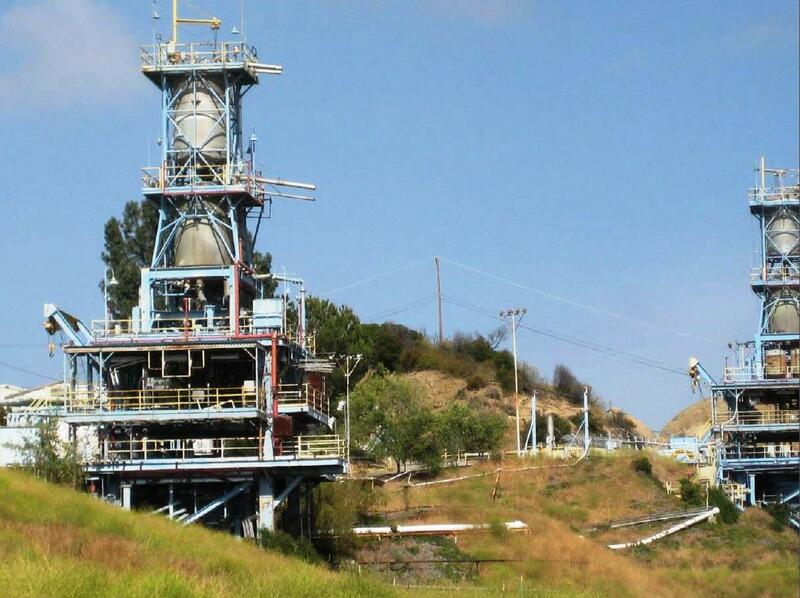 Rocketdyne needs to make it Right to private civilians that grew up in Santa Susana Knolls. I was one child, now grown, 54-ish, handicapped, et cetera; please inform truthfully to the public. If we want change, it will have to come as the result of lawsuits or large scale political change. Vote these guys out of office, and get qualified professionals to treat this matter with the scientific rigor it deserves. Stop voting for tweedle dee and tweedle dumb. And, thank you Michael Collins for doing the hard work of exposing the useless promises of do-nothing studies that accomplish nothing but the intended obfuscation of facts. @Brenda Miller: That this could be your dad is shocking. He would have died a few months shy of 12 years after this photo was taken. May I ask you if you know what kind of cancer it was? It’s a strong possibility that is my dad in the picture shoveling without a mask. He died in April of 1991 of cancer. He was very careful and always followed the safety guidelines and had special hazmat credentials so if he wasn’t wearing a mask he was told he didn’t need to. Re rocket manny who wrote: I too am mad as hell that these sobs whose salaries Im paying are going to leave all that crap up on the hill where people like me on royal ave in Simi valley will keep getting nuked forever with no clean up.Those lab maps of the contamination say it all and the governement is going to let the polluters walk. I WILL comment. My question is what the hell is going on with that dude with a shovel digging out a reactor “without a mask on”? Am I nuts or is that unsafe breathing in that dust and being so close to that reactor core? Michael Collins: Being exposed to intensely radioactive concrete dust certainly deserves at least a mask. Concrete absorbs radiation. Being so close to the reactor vessel also seems incredibly dangerous. 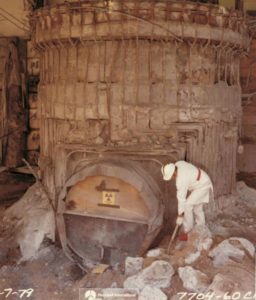 EnviroReporter.com has two galleries here and here showing the the demolition of the infamous Sodium Reactor Experiment (SRE) which partially melted down in 1959 and not one worker has a face mask on. 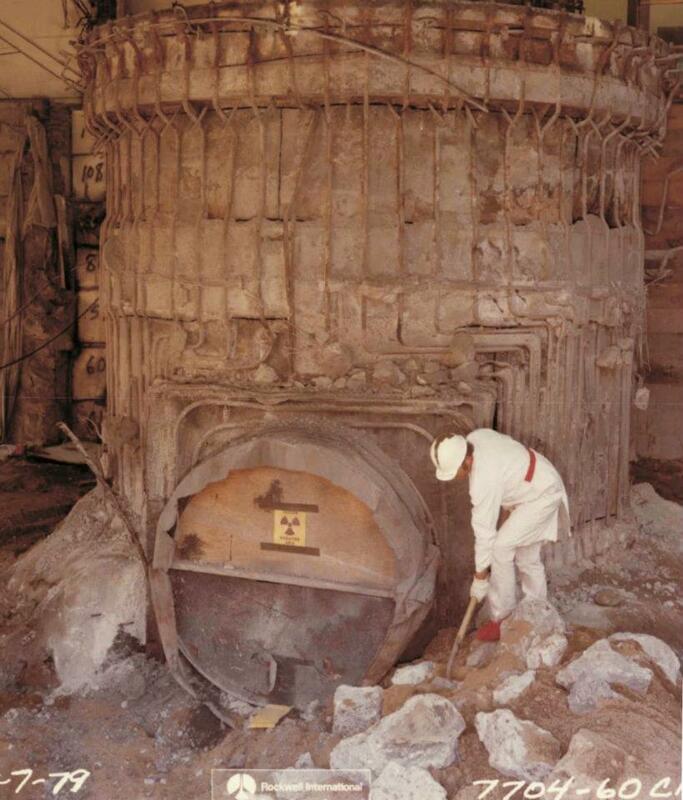 One of these workers, Jim Garner, said that his work demolishing reactors at SSFL gave him cancer. To get workers to not use masks suggests that they were told it was safe to do, that the radiation levels were not hazardous, much like what Garner said. This speaks to a reckless and dangerous attitude towards radiation safety. That attitude was in evidence again in 2002 when this reporter discovered radiation in a SSFL reactor that was being decommissioned that government inspectors had missed. 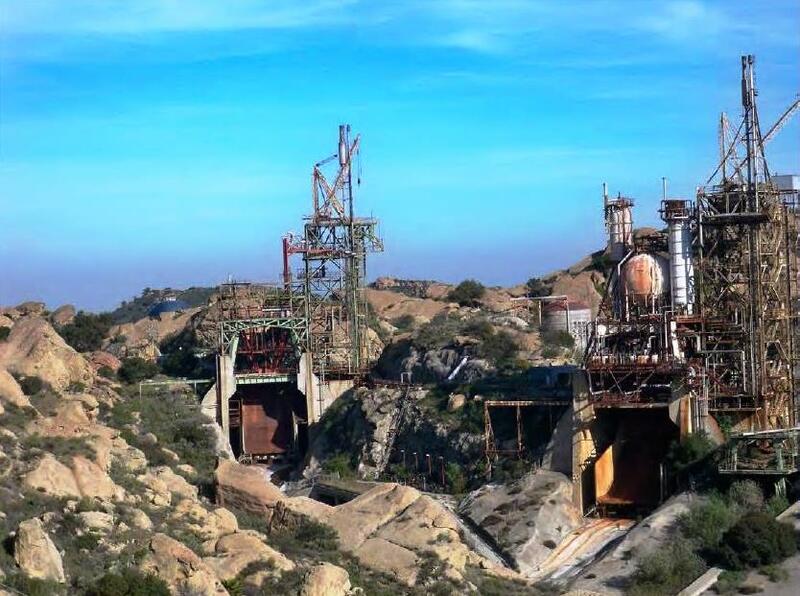 We documented this in Rocketdyne – It’s the Pits. 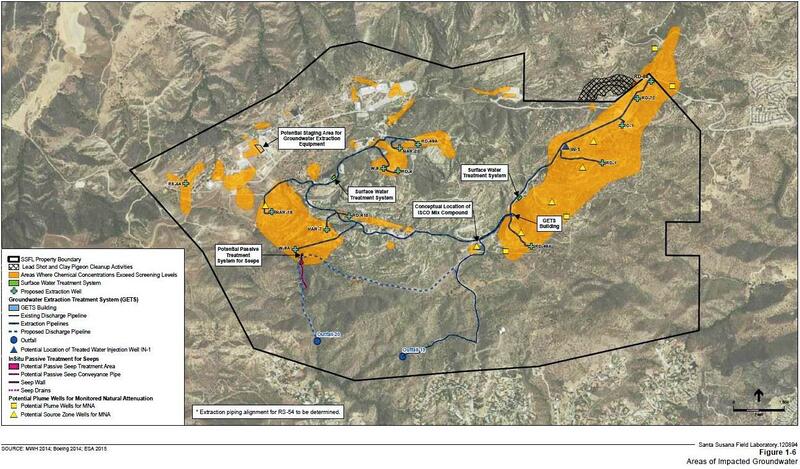 As we report here in Toxics agency buries Santa Susana Field Laboratory cleanup, massive amounts of radiation and chemicals could be left in place at SSFL should this DEIR succeed in gutting the Rocketdyne cleanup. The reckless and dangerous attitude towards radiation safety persists going so far as to portray cleanup as harmful to this polluted environment without copping to the public just how many people will get cancer and die in risk assessments of leaving the contamination in place. That’s why cleanup activists and community members are urging people to comment on DTSC’s DEIR before December 7. I too am mad as hell that these sobs whose salaries Im paying are going to leave all that crap up on the hill where people like me on royal ave in Simi valley will keep getting nuked forever with no clean up.Those lab maps of the contamination say it all and the governement is going to let the polluters walk. I WILL comment. My question is what the hell is going on with that dude with a shovel digging out a reactor “without a mask on”? Am I nuts or is that unsafe breathing in that dust and being so close to that reactor core? You can make your opinion heard using the Rocketdyne Cleanup Coalition comment form or you can comment directly on the DTSC website. This is outrageous. How do we comment? After all of these years attempting to get the SSFL properly cleaned up, this PEIR is absolutely the WORST OF THE WORST! How does the DTSC even begin to sign off on report like this….one that gives literally no information about what the cleanup will be, and one that indicates that they absolutely do NOT care if everyone gets cancer. It is all about MONEY MONEY MONEY remaining in Boeing’s pocket, and nothing whatsoever to do with human life and welfare. I am completely beyond disappointed and angry with the DTSC!!! Clearly, they are in Boeing’s pocket, immoral to the maximum, and a disgrace to our Government.